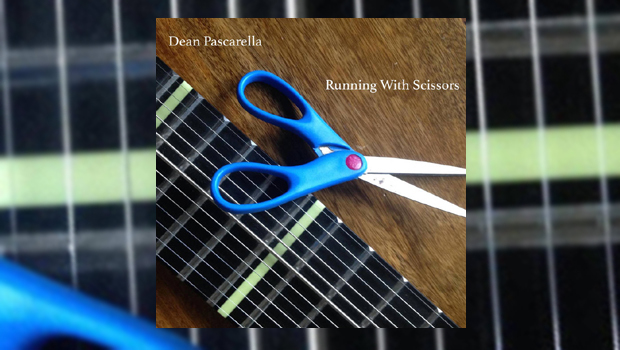 With a talent for producing catchy melodies, Dean Pascarella, from Long Island, New York, is an accomplished multi-instrumentalist and he has a penchant for unusual instruments. Despite having a background in guitar, Dean uses the Chapman Stick as the foundation for his compositions and the guitar and drums and any other instruments are layered over this. Dean uses Theremin, Quarter Tone guitar and a device called Maschine (no, that isn’t a typo) which, I believe, is like a sophisticated sequencer. He also adds interesting effects using Adrian Belew’s iPhone App, Flux:FX to add interest. His curiosity regarding unorthodox instruments, is apparent on this album. Clearly the versatility of the Stick and his methodology works well as Running With Scissors is quite a multi-faceted accomplishment. This is a package of well-crafted instrumentals. Whereas some may be more comfortable with a traditional song structure and a vocal accompaniment, I think that is a bold thing to do for any artist or band. For me music is about the experience, not (necessarily) about the hook or the catchy lyric that you can belt out in the privacy of your car. This is a harder art to manage because the artist demands of the listener that they conjure up their own imagery or back story to accompany the soundtrack that the performer is supplying. It makes you work a little as a listener and, as such, involves the listener in a different way to having a good old sing-along. So in a way this is “mood music”. Or, if you like, it is like a collection of little movie soundtracks that you need to play out in your head. So what moods can you expect? That’s down to your interpretation! I know that I should get a grip on these genres so I can write more helpful reviews but with this album you’re on your own because, as I alluded to earlier, Dean clearly doesn’t pin himself down to one style. There are hints of progressive rock but also heavy riffs, Space Rock, some pretty laid back stuff and a number of other styles I am not able to describe so you’ll have to give it a listen and get your labeller out, if that floats your boat. There are heavy and edgy riffs throughout the album that might give a nod to some of Dean’s musical influences but these influences are just that. Originality trumps influence here. There are also mellow little tunes that you could chill to. And what sort of movies will play out? Well, The Andromeda Dude Ranch, with its jangly 12-string Rickenbacker, has a “California Rock” feel and the title sets the scene. Dean’s sense of humour is apparent in this title. Imagine a Galaxy, far, far away, where quantity surveyors and architects can play at being real men, herding alien cattle while on holiday (that’s “vacation” to you people across the pond)! That’s what I was imagining for three and a half minutes. In fact I was reminded of Journey Of The Sorcerer by The Eagles – remember The Hitchhiker’s Guide To The Galaxy? Yes THAT Journey Of The Sorcerer. Please note: I didn’t say “Sounds like”. There are many influences here but they are hinted at not copied. Even parts of Soon hint strongly of a George Harrison influence. The production and mix, to my ear, sounds great. I’ve been listening through a variety of setups, including a Sony Car Stereo, on my Android phone through some Shure earbuds and through my PC, both through some slightly broken old speakers and through a pair of Studio Headphones. I have to say I’m really impressed with the way it plays on just about anything. The instruments are crisply defined and intelligently positioned in the stereo mix. I wrote this review over a little more than a week with a gap of a few days and there’s always a chance that after your first take on an album your initial enthusiasm has waned. That just wasn’t the case for me when I returned to writing the review and it was great to revisit Running With Scissors. I played it on a loop. There’s an instant comfortable familiarity with some of these songs and despite the occasional heavy side they often resolve in such a way that there’s an overall joyous feel to the whole album. I also found that after a week I was playing You Are Here and whistling along with the guitar… at least, up until my whistling skills were left behind by Dean’s excellent playing! So there ARE hooks and you may well find that one or another of the tracks is your ear-worm of the day! I’d be surprised if you can’t find at least one track on this album to enjoy.